Each fall millions of monarch butterflies use a sophisticated navigation system to transverse 2,000 miles from breeding sites across the eastern United States to an overwintering habitat in specific groves of fir trees in central Mexico. Scientists at the University of Massachusetts Medical School and Worcester Polytechnic Institute have identified a new component of this complex system. They reported in Nature Communications that monarchs use a light-dependent, inclination magnetic compass to help them orient southward during migration. 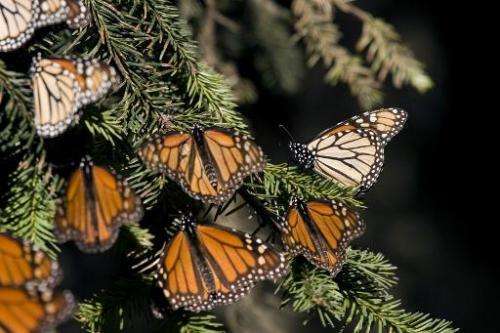 "Taken as a whole, our study reveals another fascinating aspect of the monarch butterfly migratory behavior," said senior study author Steven Reppert, MD, the Higgins Family Professor of Neuroscience and distinguished professor of neurobiology at UMass Medical School. "Greater knowledge of the mechanisms underlying the fall migration may well aid in its preservation, currently threatened by climate change and by the continuing loss of milkweed and overwintering habitats. A new vulnerability to now consider is the potential disruption of the magnetic compass in the monarchs by human-induced electromagnetic noise, which can also affect geomagnetic orientation in migratory birds." Co-author Robert Gegear, PhD, assistant professor of biology and biotechnology at WPI, explained, "Our study shows that monarchs use a sophisticated magnetic inclination compass system for navigation similar to that used by much larger-brained migratory vertebrates such as birds and sea turtles." Monarchs use a time-compensated sun compass in their antenna to help them make their 2,000 mile migratory journey to overwintering sites. During the absence of daylight cues, such as under dense cloud cover, migrants have been, surprisingly, seen flying in the expected southerly direction. It's been hypothesized that monarchs use geomagnetic cues to help navigate when day light cues are unavailable to them during migration. Previous attempts by scientists to isolate use of an internal inclination compass in monarchs have yielded conflicting or unconvincing results. These studies, however, may not have accounted for the possibility that the magnetic compass was influenced by ultraviolet light that can penetrate cloud cover. Given the ability of monarch cryptochromes (CRY), a class of proteins that are sensitive to ultraviolet A/blue light, to restore a light-dependent magnetic response in CRY-deficient Drosophila, Reppert and colleagues suspected that monarchs also possessed a light-dependent magnetic compass. Using flight simulators equipped with artificial magnetic fields, Patrick Guerra, PhD, a postdoctoral fellow in the Reppert lab, examined monarch flight behavior under diffuse white light conditions. He found that tethered monarchs in the simulators oriented themselves in a southerly direction. Further tests in the simulator revealed that the butterflies used the inclination angle of Earth's magnetic field to guide their movement. Reversing the direction of the inclination caused the monarchs to orient in the opposite direction, to the north instead of the south. To test the light-dependence of the monarch's magnetic compass, Dr. Guerra applied a series of wavelength blocking filters to the lights in the simulator. Monarchs exposed to light only in the wavelength range above 420nm exhibited a lack of direction by flying in circles. Monarchs exposed to light in the wavelength range above 380nm showed clear signs of directional flight. These tests showed that the monarch's magnetic compass, and thus directional flight, was dependent on exposure to light wavelengths (380nm to 420nm) found in the ultraviolet A/blue light spectral range. Together, these results provide the first demonstration that the monarch butterfly uses a light-dependent, inclination compass during its long journey. It is also the first evidence of such a navigational tool in a long-distance migratory insect. "For migratory monarchs, the inclination compass may serve as an important back up system when daylight cues are unavailable," Guerra said. "It may also augment hand-in-hand with the time-compensated sun compass to provide orientation and directionality throughout the migration process." The next step for Reppert and colleagues will be to evaluate the molecular and genetic mechanisms of magneto-reception in the monarch butterfly and the involvement of CRYs. If this capability developed over "evolutionary" time-scales - which would involve several reversals of the magnetic polarity of the earth's field - they must have been going to the wrong place for a lot of the time?? !